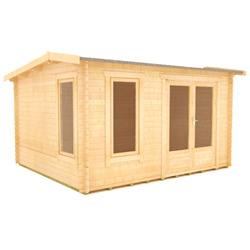 The Rho Log Cabin is another superbly manufactured product. 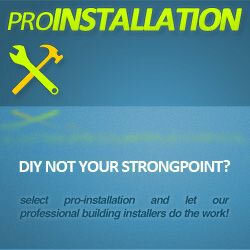 We welcome you to another beautiful and unique pent roof Log Cabin, as always, built with quality in mind. 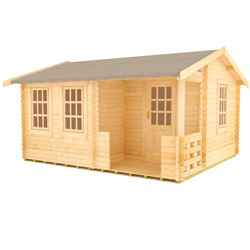 One of the best pent roof style log cabins on offer is the Rho log cabin - a very smart looking and feeling 44mm log cabin. 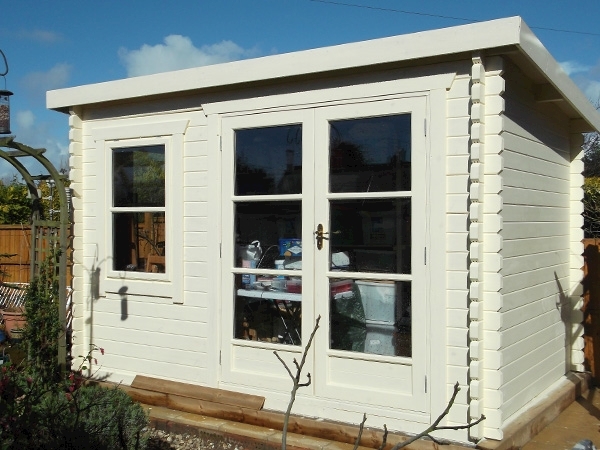 Features on the Rho log cabin include the joiner made windows, which are draft sealed as standard, as well as the draft sealed and lockable double fully glazed doors. 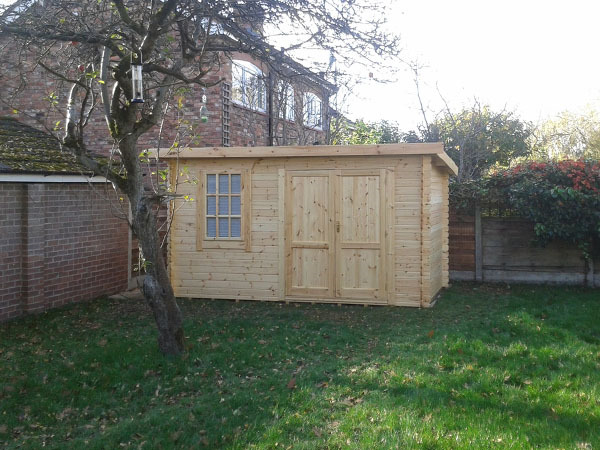 The Rho is a hugely adaptable building and is easy to customise, you may wish to use it as an outdoor bedroom, office, home gym, the list is endless. 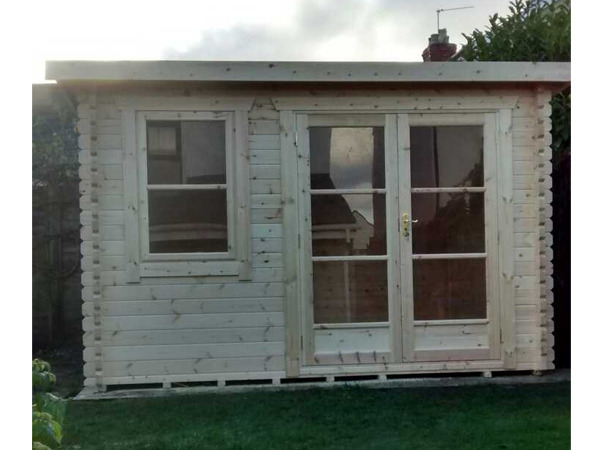 Like the rest of our range of log cabins, we won't be beaten on material quality and we make sure we use predominantly slow grown High Grade European Softwoods from reliable sources. 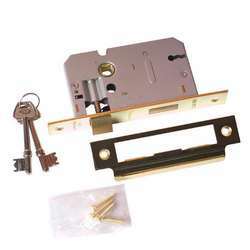 The Rho can also come in a huge array of sizes, if you want anything that's not shown on the site, or have any questions about our products - just give our experienced sales team a call on 0113 205 4189. 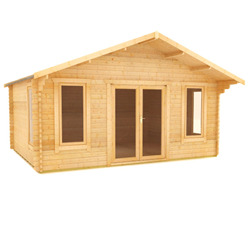 RHO LOG CABINS feature high-grade 44mm interlocking planned and finished logs – beware of log cabins that feature rough edged boards machined from poor quality timber. 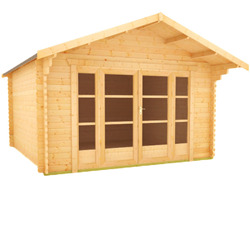 RHO LOG CABINS feature a specially designed 4-way chamfered notch-joint system ensuring a tight fit to all boards with little room for damp or wind penetration – beware of log cabins that feature square cut logs with square notch-joint, often leaving a sloppy joint with large visible gaps. RHO LOG CABINS feature heavy duty green mineral roofing felt as standard, with the easy option to upgrade to premium quality roof shingles – beware of log cabins that come with no roof covering, leaving the cabin completely open to the elements. 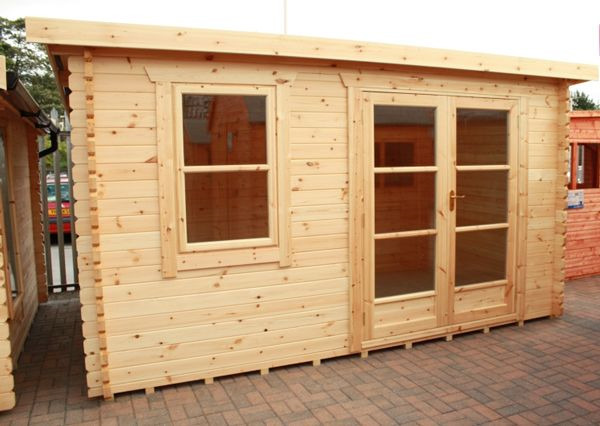 RHO LOG CABINS feature oversized extra large doors and windows – most competitor log cabins use narrow doors which can prove difficult for access. 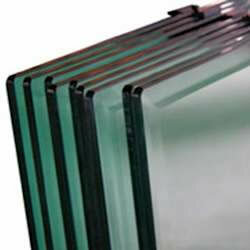 RHO LOG CABINS feature high quality glazing which is factory siliconed and internally beaded to all windows – beware of log cabins that feature lesser quality materials and provide no window beading. 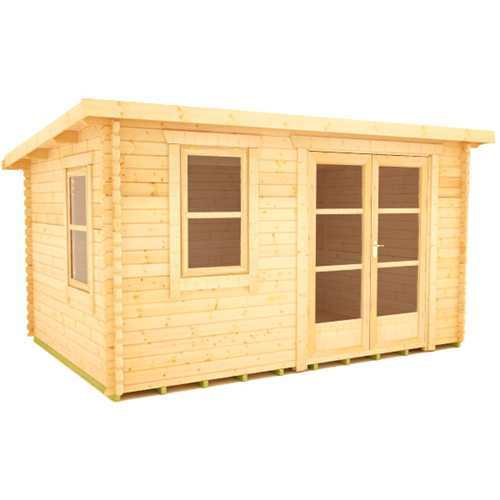 RHO LOG CABINS feature a generous all round roof overhang which protects the building from severe conditions – beware of log cabins with little or no roof overhanging leaving them vulnerable to the wind and rain.